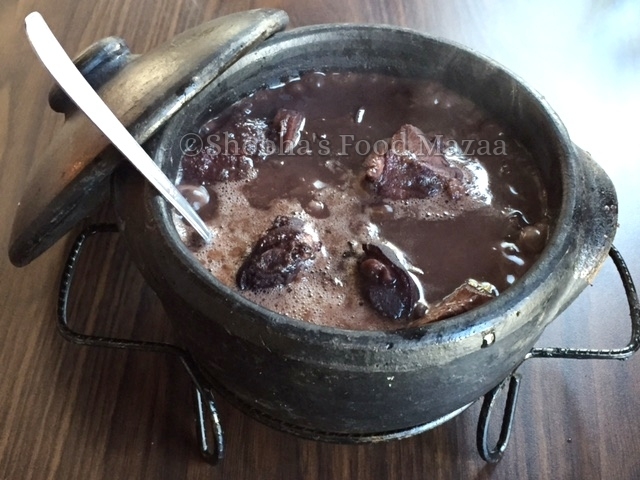 Feijoada, pronounced as (fay-zhwa-dah) is a traditional dish of Brazil... black bean stew cooked with meats and sausages. It is slow cooked in the clay pots. There is not much tempering in it except black pepper, a little local liquor called pinga / cachaca (pronounced - ka-sha-sa) and orange juice are added towards the end. This stew is served with plain rice and accompaniments like couve, ripe banana fritters, fried pork chops, farofa, and orange slices. In the state of Bahia vegetables are also added to the stew along with the meats. 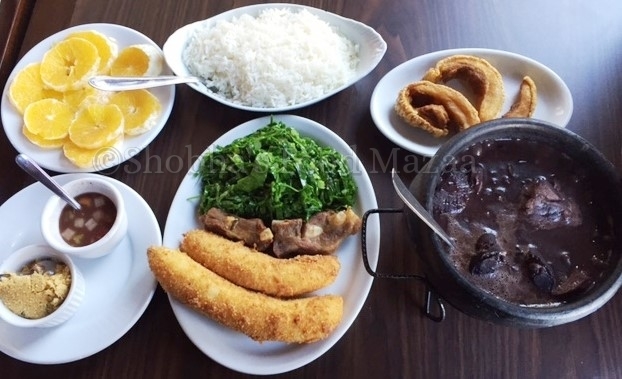 Wednesday and Saturday are the feijoada days and almost all the restaurants in Brazil serve this dish for lunch only. You cannot find it on any other days. 1. In a saucepan heat a little oil and fry the bacon and sausage slices separately. Set aside. 2. Now take a big pot for cooking and tip in the fried bacon along with the meats mentioned in the ingredients list. Sausages will be added later as they get cooked fast. 3. Next add the soaked black beans and sufficient water to cook. 4. In a saucepan heat oil and fry the onion and garlic to a light brown colour. Add this to the cooking meats. 5. Tip in the bay leaves and spring onions. Add a little salt and allow it to simmer for 1 and 1/2 to 2 hours or until the meats and beans are done. Add the sausage slices when it is 3/4 ths done. 6. Finally add the juice of half an orange and the pinga or cachaca . Add the black pepper and salt if needed. 7. Simmer for a minute. Serve with plain rice and all the accompaniments. its something new to me.. Yes it has to be as it is a Brazilian delicacy.. I actually had this at a restaurant a couple of weeks ago and it was delicious. I can't wait to try making it myself. love the pot of black beans and whole platter. Thanks .. awesome meal !